Laurie Ann Neira was aboard American Airlines Flight 11 departing from Boston to Los Angeles, after a visit with family. At 8:46 am on September 11th, 2001, the flight was purposefully flown into the North Tower of the World Trade Center, killing all 76 passengers and 11 crew members. This was the second time the North Tower (1993) had been attacked by Islamic terrorists. 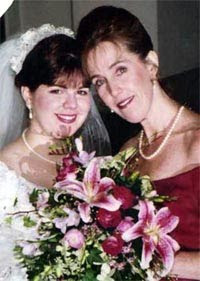 The photograph at the right is Laurie in 1997 with her daughter Francisca, known as Frannie, on Frannie’s wedding day. Laurie worked for Your Office Genie, and a look around the Internet finds many workers remembering her fondly. Some knew her personally, and others recognized her as a co-worker they had not yet met. One of Laurie’s best friends as a teenager in Rowley, Massachusetts, Debbie Madruga Richards, wrote fond memories of their earlier friendship, when they moved to ‘The Big Apple’ together at age 18. Laurie was born in Amesbury, Massachusetts on December 8, 1952. She met her future husband, Gilberto (Gil) in New York City. In 1975 the family, now consisting of Mom, Dad and Francisca moved to Los Angeles. Later, Frannie’s brother Christopher was born. Each year after the move, the family returned to their Massachusetts roots for a visit. Eventually, granddaughter Amanda was born. Frannie and Laurie were in Boston on their annual trip, but were flying back to L.A. separately. “We had the best time together. Then, on 9/11/01 we went to the airport together. The car rental shuttle dropped [Laurie] off at her terminal first, she going on American, and me going on Delta. American Airlines Flight 11 was taken over by hijackers after about 15 minutes after takeoff. Frannie’s Delta flight made an emergency landing in Ohio. That is how she learned of her mother’s fate. All flights were grounded, and she was left alone there for three days. Frannie says her mother was the glue that held the family together. Note to family and friends: If you find this tribute and would like to add any information about Laurie Ann Neira, please let me know. My email is under the contact tab under my header. Maggie’s Notebook honors Laurie Ann Neira through Project 2996, a tribute to the victims of September 11, 2001. There are still victims who do not have tribute pages online. Please visit Project 2996 to find a name and publish a remembrance.